Alumni, faculty, staff, students and friends invited to host 125 celebrations around the world! 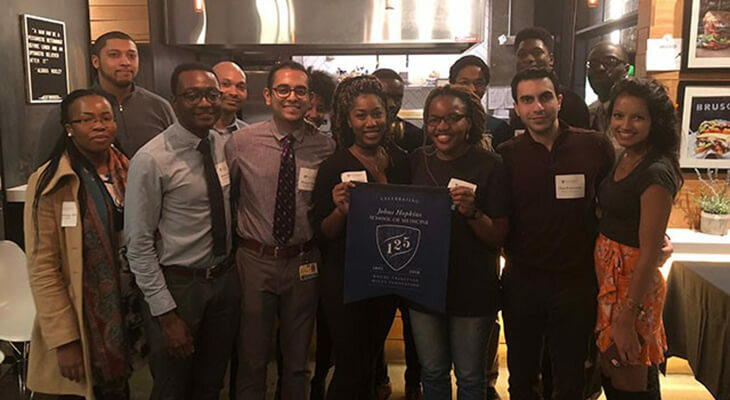 Underrepresented in Medicine students, alumni, residents and house staff gather for an evening of networking and conversation at Cava Mezze in Baltimore. Dean & CEO Paul B. Rothman hosted a lunch to honor the Society of Scholars inductees, nominated by School of Medicine faculty members. From the left: William G. Nelson, M.D., Ph.D., Patrick Hwu, M.D. (inductee), Jeremy N. Rich, M.D., M.H.S., M.B.A. (inductee), Paul B. Rothman, M.D., Sonja Rasmussen, M.D., M.S. (inductee), Ada Hamosh, M.D., M.P.H., Patricia Rich, Patti Vining, M.D. 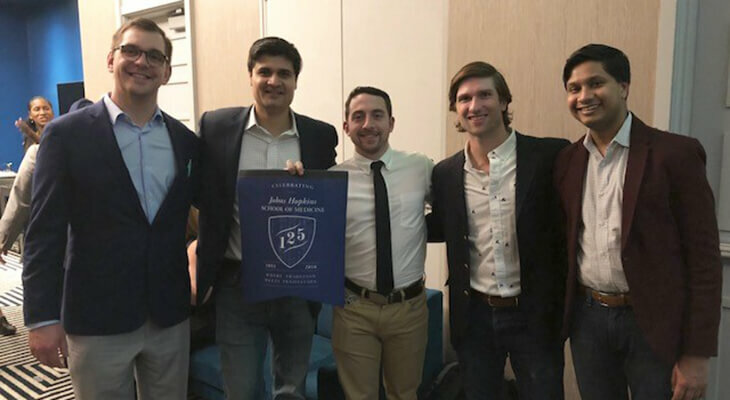 Johns Hopkins Division of Interventional Radiology Alumni gathered for a reception at the 2018 Society of Interventional Radiology Annual Meeting in Los Angeles on March 20th. 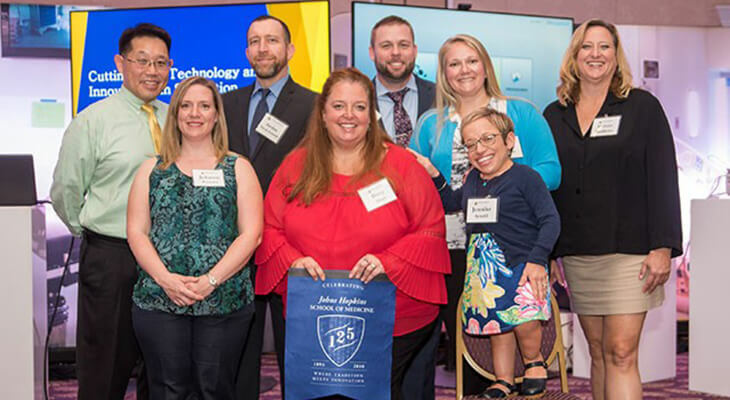 On Monday, March 19, 2018, the Johns Hopkins Department of Pathology hosted an alumni reception at the annual United States and Canadian Academy of Pathology meeting. GynOb alumni gathered on March 1, 2018 at DC's National Harbor for a dinner hosted by GynOb Director, Dr. Andy Satin, during the CREOG-APGO conference. 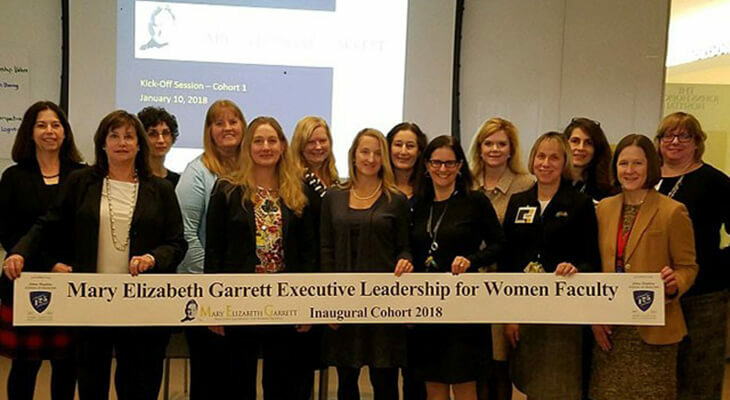 The inaugural cohort of the Mary Elizabeth Garrett Executive Leadership Program for Women Faculty held a kickoff event on Jan. 10 - becoming one of our first Experience 125 celebrations! The Johns Hopkins Medicine Innovation Experience was a new feature at the 2018 Johns Hopkins Medicine Dean's Symposium, held Feb, 7-8 in Gulf Coast and Palm Beach, Florida. Guests explored five hands-on stations as Simulation Center and Johns Hopkins All Children's Hospital faculty (pictured) shared how we improve patient safety, while advancing simulation technology, research and teaching. Emery Herman, MD, invited alumni in Cooperstown, NY, to dinner at the Otesaga Inn. 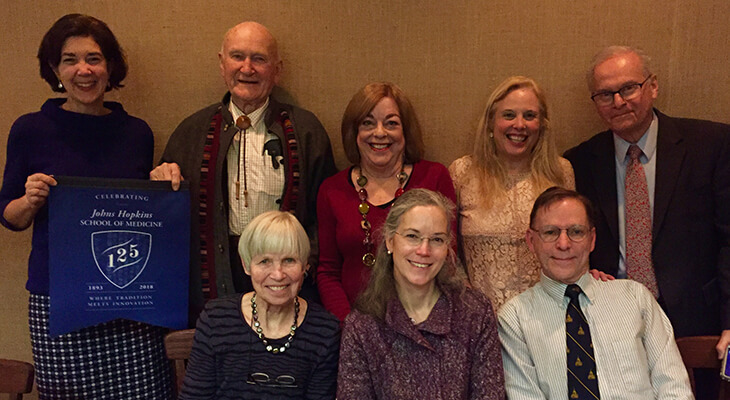 First row: Nancy Herman, Elizabeth Redd, M96, John Fisk, M92. Second row: Helen Kennelly (SOM alumni relations) Emery Herman, M53, Carolyn Mook, M73, Faith Fisk, and Paul Steinberg, M63. 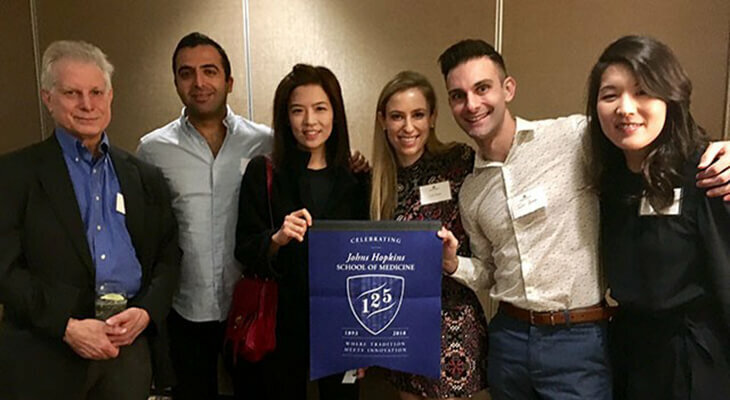 Alumni near and far joined the Johns Hopkins Dermatology's Alumni & Friends Reception at the American Academy of Dermatology Annual Meeting in San Diego, CA on February 17, 2018. Attendees included (from left to right) David Stein, MD, Nate Jourabchi, MD, Hana Jeon, MD, Lark Guss, MD, John Zampella, MD, and Noori Kim, MD. In October 2018, the Johns Hopkins University School of Medicine turned 125 years old. We invite alumni, faculty, staff, students and friends to experience 125 years of tradition and innovation by hosting 125 social gatherings around the globe. No matter where you are in the world, we want you to join the celebration! Join an upcoming Experience 125 Celebration! Interested in hosting an Experience 125 celebration? Design it however you’d like. Formal. Casual. Quick snacks. Three-course meal. Happy Hour. 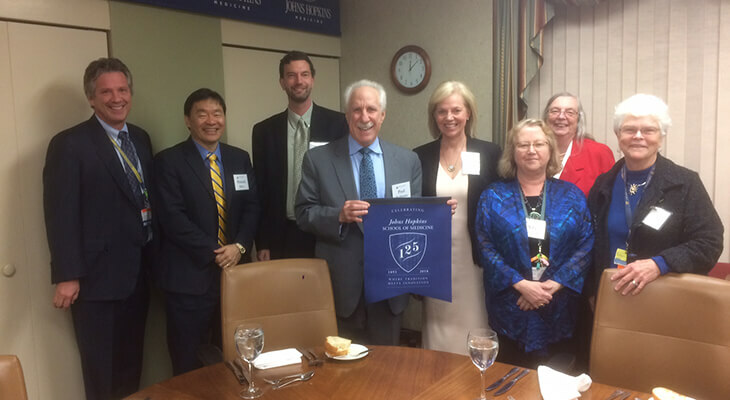 Any gathering of two or more friends of the Johns Hopkins University School of Medicine counts – just be sure to take a photo holding up 125! Hosts will serve as ambassadors for the School of Medicine by gathering fellow alumni, faculty, staff, donors, students and friends to be a part of the Experience 125 celebration. The School of Medicine is unable to provide financial support for celebrations, but we have prepared a toolkit equipped with School of Medicine highlights, anniversary talking points, and other resources to help make your event spectacular. Questions? Contact us at experience125@jhmi.edu or 410-361-6565. 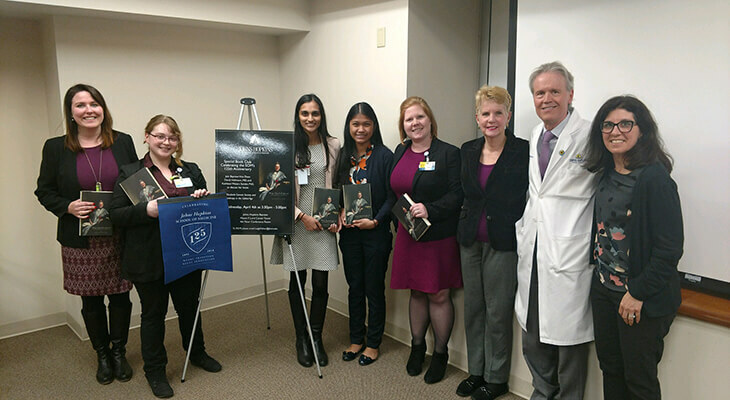 To learn more about The Johns Hopkins University School of Medicine 125th Anniversary, click here!